Purple_Monarch_Envelopes_-_3_78_x_7_12 is rated 5.0 out of 5 by 2. Rated 5 out of 5 by beckywk from Great envelopes! Love the color and size is perfect for our custom notecards! Thanks! Rated 5 out of 5 by Purple Lady from Purple envelopes I bought purple envelopes in two sizes. They were perfect! Lorde totally got it wrong when she said that we'll never be royals. With this purple monarch envelope, Lorde herself will bow down to you. We’re sure you'll feel like royalty after that. This monarch (fitting right?) envelope will remind all of your coworkers, friends, fellow kings and queens that you are the Queen Bee, that you'll rule, and that you'll live that fantasy. Deciding on this color alone makes you superior to those serfs below you. And when they receive this envelope, they will not forget your reigning power over them. A little much? Psh, not for a monarch like you! But don't you worry, your serfs will love you for using this 30% recycled envelope. Maybe they'll even cheer you on as you walk out on your beautiful balcony to give your best royalty wave. Wait! We can already hear them! 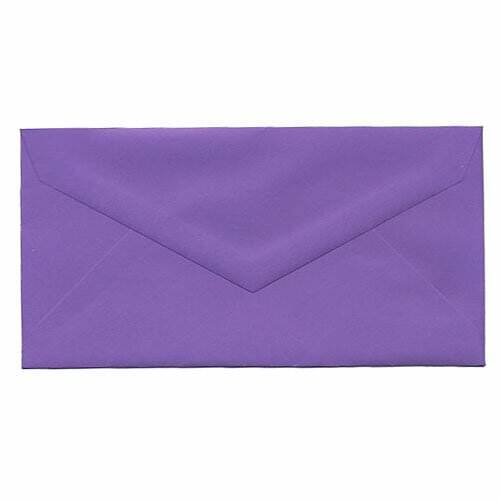 Purple Monarch Envelopes measure 3 7/8 x 7 1/2. Available in Brite Hue Recycled Violet. Side note: Ever think it's kind of ironic that she calls herself Lorde?